Nearly three-quarters of Earth is covered by ocean water, yet only 5 percent of what is beneath the shimmering blue waves has been explored. The dearth of information isn’t because of an apathetic scientific community. Until a few years ago, technology needed for leaps and bounds in ocean exploration didn’t exist. And the large, fickle oceans have a way of complicating research efforts. But a decade of persistence and planning has put the Ocean Observatories Initiative in place to begin making strides. The initiative’s first deployment of cable-connected tethered ocean profilers will begin this July in the northeast Pacific Ocean. Design, construction, and installation of the profilers are managed by the University of Washington. “Sites off the Oregon coast were chosen because they were relatively close yet are very active geologically, oceanographically, biologically, or all three,” said Eric McRae, principal electrical engineer at UW’s Applied Physics Lab. The National Science Foundation has funded the gargantuan effort, which is managed by the Consortium for Ocean Leadership in Washington, D.C. Collaborators include Woods Hole Oceanographic Institution, Scripps Institution of Oceanography and several other U.S. universities and contractors. 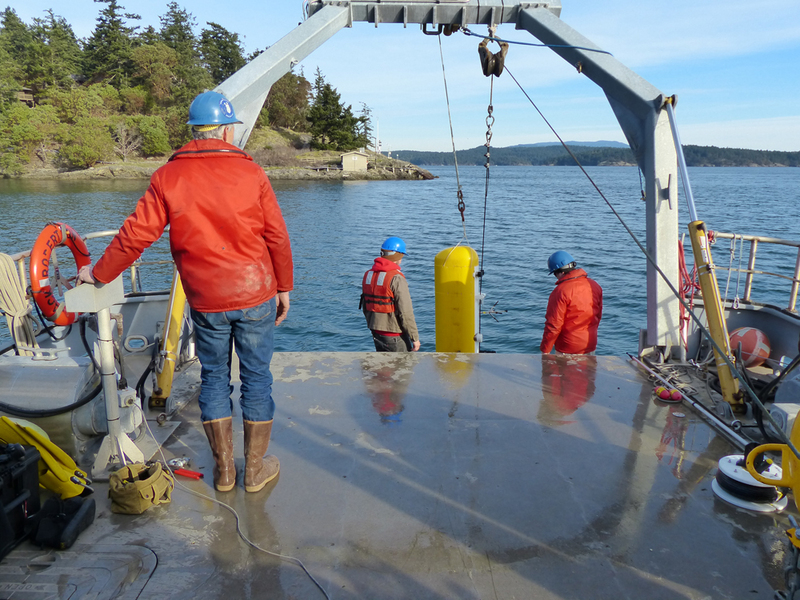 Profiler installations are supported by part of the $239 million in NSF funding to the University of Washington for design, construction, and early operations of the 575-mile cabled component of the Ocean Observatories Initiative, pending availability of funds and Congressional approval. The most distant profilers, some 300 miles offshore, will sit next to an active volcano that generates lots of hydrothermal activity. 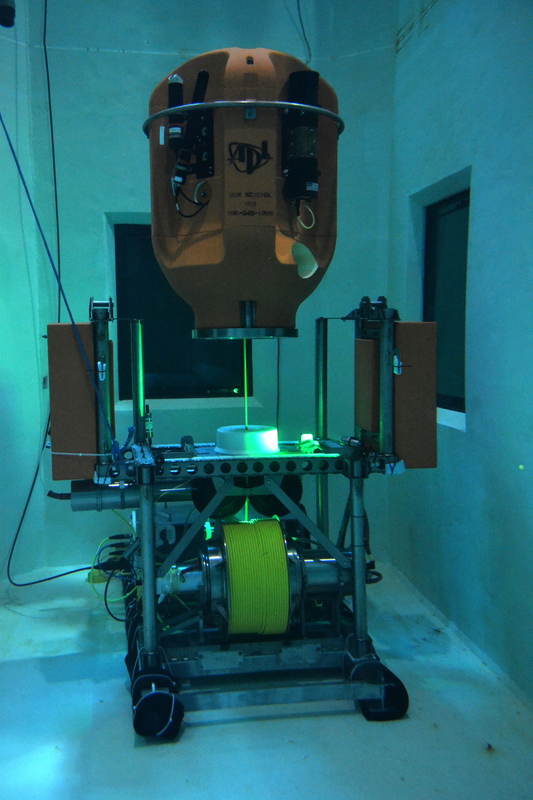 A deep profiler is rigged to cycle nearly 3,000 meters up and down a mooring line while tracking ocean parameters like conductivity, depth, temperature, dissolved oxygen, organic matter and chlorophyll-a. That profiler works in conjunction with a nearby shallow profiler which docks 200 meters from the surface on an instrumented sensing platform and cycles up to the surface and back. The shallow profiler supports sensors for photosynthetically active radiation, nitrate and pH. It will carry a fluorometer, current meter and CTD sensor. Both profilers, along with instrument arrays on the seafloor, will be deployed using a remotely operated underwater vehicle. All will be connected to shore by electrical-optical cables that can support data rates of 10 gigabits per second. Two other sites closer to the Oregon coast, one at 600-meter water depth west of Newport and one at the base of the continental slope, will also be instrumented with profiler pairs and seafloor instruments. In addition to advancing sensing tech, one of the greatest values of the cabled observatory is that it will be connected 24/7 to the Internet. Past ocean research has relied on manual data retrieval, but a cabled network will provide researchers continuous, real-time data. All Ocean Observatories Initiative data, including high-definition video from the cabled observatory, will be publicly available through the initiative’s cyber infrastructure. The university is scheduled to complete installation of the Ocean Observatories Initiative cabled component in October 2014 and commissioning is planned for early 2015. The project is designed for a 25-year lifetime. Cables and anchors associated with the profilers will be replaced every five years; and profilers will operate on a rotating deployment schedule for routine maintenance.